Travel Size. An Alcohol Free, Foaming Hand Sanitizer. Meet the Germinator. An all natural way to kill germs and keep hands safe for holding. It works just as good as the regular stuff, but is much safer and easier on your skin. Germs are everywhere, so in order to be prepared, you will need a sanitizer that can go everywhere too. This convenient, travel size hand cleanser will kill 99.9% of all germs when you are on the go, and it will do so with a safe, alcohol free solution. It is a foaming hand sanitizer, so it is easy to dispense, and the same amount will go much further. Pack one in your purse, diaper bag, glove box or desk drawer to always have a safe and convenient way to stop the spread of the flu, common colds and other dirty germs. This small size is ideal for on-the-go style applications, but if you would prefer a larger size, in a more standard size pump bottle, then check out the 250 ml. Germinator. This alcohol free sanitizer is made from a plant based solution that enables you to safely deal with germs. It won't dry out or harm your skin like alcohol based products, and it is totally safe for use by children and people with sensitive skin. This natural alternative also contains a moisturizing agent to soften and condition your skin as you sanitize. In just 15 seconds you will be able to kill virtually every disease causing germ on your hands and make them softer at the same time. Because it is a foaming solution, you will also get twice as many uses verses the same size of a traditional gel sanitizer. Simply pump a small amount of foam into your palm, then rub thoroughly over all surfaces of your hands. Keep rubbing until your skin becomes completely dry. There is no rinsing necessary and you will not need a towel to dry off. This gentle, yet powerful solution quickly neutralizes germs and leaves your hands feeling great. It contains no fragrance, harsh chemicals, or toxic ingredients. This makes it great for virtually anyone and perfect for those with sensitive skin. Traditional hand sanitizers are heavily reliant on alcohol or other similar compounds to kill germs. These can be bad for your skin, but more importantly incredibly dangerous if accidentally ingested by young ones. Just a small amount either licked off a hand, or ingested directly from the bottle can cause serious problems. This natural alternative works just as good, but you don't have to worry about any of the side effects. It is an easy-to-use product that is incredibly safe and effective, and thanks to the natural foaming delivery method, it will last much longer that traditional gels too! Germinator alcohol free, foaming hand sanitizer kills 99.9% of germs that may cause illness, including E-Coli and MRSA in just 15 seconds! This gentle yet effective formula contains added moisturizing agents to enhance skin too. It comes in a perfectly sized travel container so you can easily take it with you anywhere. Keep one in your car, place it in the diaper bag or your purse, desk drawers at work, or take it with you on a trip. This travel size is great for all kinds of applications and allows you to never be without it. The compact size makes it easy to whip out quickly to clean hands any time you need to, and because it doesn't contain anything harsh or harmful, you can feel good about using as much as you want. What is even better is that it won't harm the environment and it is totally safe for use by children and people with sensitive skin. Stop using harmful alcohol based sanitizers. Choose a safe and natural alternative. Order Yours Today! 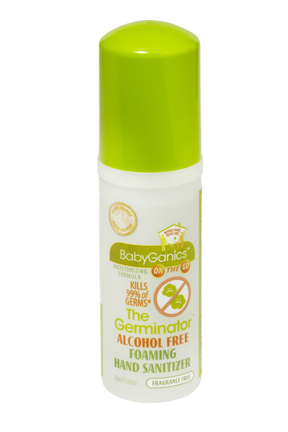 The Germinator - Alcohol Free Hand Sanitizer - Sanitize your hands the safe way! This alcohol free hand sanitizer works great and is safer than traditional products. Get the same results without any of the drawbacks. Order Yours Today!